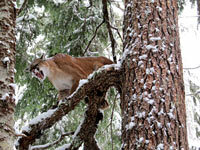 Vancouver Island, British Columbia, Canada has the highest concentration of Mountain Lions in North America!! North Island Guide Outfitters' Vancouver Island guiding concession is one of the few "two cat" territories in North America. 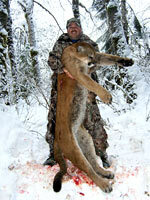 The population of Cougars continues to grow and hunter success is extremely high. Our BC Cougar hunts occur in the winter months; January and February are preferable when snow tracking and identification of Cougar size make hunting more effective. Vancouver Island, BC is presently experiencing a very high cycle in Cougar populations, with a good number of tracks being encountered on most hunting days. 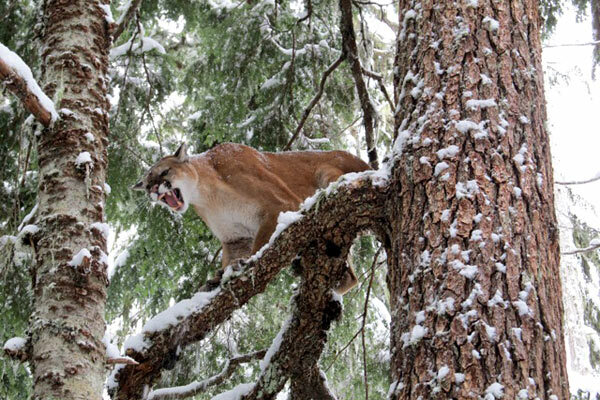 Due to the high populations, hunters may choose to harvest two cougars on the same hunt. 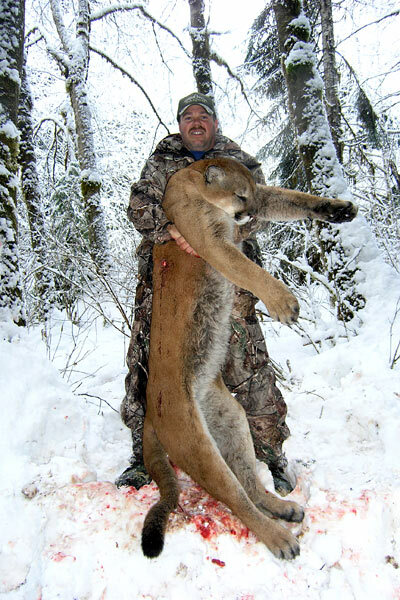 Cougar hunting guides at North Island Guide Outfitters have been hand picked by owner / operator Dave Fyfe for their world-class cougar hounds, and have maintained over 90% success rate since 1991 with "on call" hunts. It is best to have the cougar hunters 'on call' during the season because weather plays an important part in a successful hunt. Scheduled cougar hunters have been 80% successful on a kill, while 'on call' hunters have had over 90% success on a trophy kill. The terrain for our Vancouver Island Cougar hunts varies, and can be selected according to the hunter's physical condition or preference. Once a Mountain Lion track is spotted, a pack of hounds is released to chase and tree the cat, then hunters pursue on foot. - Licenses and any taxidermy related costs above and beyond skinning and caping. Choice of hunting dates: Dates in order of deposits received. Deposit: 50% required at time of booking. Cancellation policy: Deposit is nonrefundable if cancellation is within 180 days of arrival date.